A collection of write-ups with health care tips, expert advices and inspiration for overall wellness and fitness. Teeth whitening like the name suggest is a procedure wherein your teeth colour is changed by a couple of shades thereby making it whiter. I am going to answer below a few of the most commonly asked questions in regard to this procedure. Q. Is whitening of the teeth safe for any age group? A. Teeth whitening is safe for most adults unless specified by the Dentist. Your tooth structure and the reason why you have stained teeth will have to be analyzed. Q. How many shades lighter can my teeth get in one session? A. Depending on the thickness of the outer layer of your teeth and the time period for which the whitening material is used, it could be anywhere between 1 to 4 shades whiter. Q. Is it safe to do this procedure at home? A. It is safe if you have consulted your Dentist before. Make sure you take proper advice before trying anything. DIYs can do more harm than good. Q. What materials are used for teeth whitening? A. Well the most common active ingredient in this procedure is Hydrogen peroxide. The material penetrates through the first layer of the tooth (Enamel), reaches the second layer and acts on it by lightening this layer. 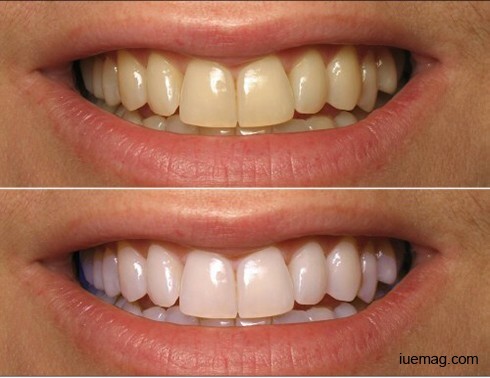 That is how a lighter shade is reflected through the first layer and you have whiter looking teeth. Q. Does this procedure have any side effects? A. You may experience sensitivity for a while, which again can be reversed by using an appropriate toothpaste and more often than not, it is short lived. Besides that, if the active ingredient, that is hydrogen peroxide, comes in contact with your gum tissues, it might get bleached too. But this is very transient; it will subside in about an hour. So basically, there are no notable side effects apart from these. Q. Do we have to keep doing the procedure over and over again? A. You might want to follow certain diet instructions to maintain the whitened teeth such as avoiding coloured drinks, smoking etc. Once you achieve the shade of your choice, you just need to maintain it. There is no need to do it over and over again unless you want a whiter shade. Q. What do you suggest? Whitening at home or at the clinic? A. I’d prefer at the clinic only because you are under the supervision of a professionally trained doctor. I hope your questions on teeth whitening are solved. Any facts, figures or references stated here are made by the author & don't reflect the endorsement of iU at all times unless otherwise drafted by official staff at iU. This article was first published here on 26th November 2016. Dr. Akshari Anchan is a contributing writer at Inspiration Unlimited eMagazine. How is 'Facebragging' Hurting Relationships?